Why are Air Compressor Lubricants Important? Compressor fluids are not typically a topic of everyday conversation, but nonetheless its importance needs to be recognized since the fluid’s functions have a direct impact on the ownership cost of your compressor. 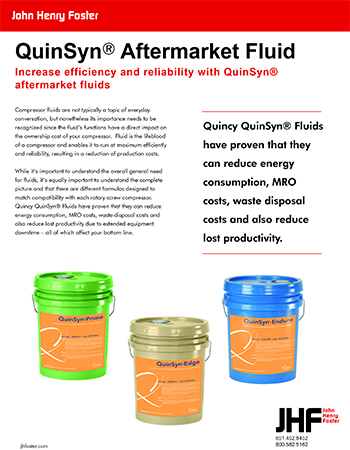 Fluid is the lifeblood of a compressor and enables it to run at maximum efficiently and reliability, resulting in a reduction of production costs. We, at John Henry Foster, want to provide you with the tools and information necessary to ensure your compressors are getting the attention they need to perform at full capacity. John Henry Foster understands the importance of specifically designed lubricants for your equipment. We provide genuine and aftermarket air compressor lubricants that maintain or extend the life of your warranty specific to our leading manufactures and their brands of air compressors and vacuum pumps. 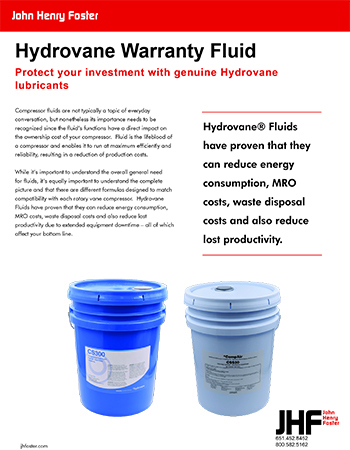 By using only genuine lubricants, you can be assured your consumables are manufactured to the same quality standards as the brand of compressor. They are designed to keep your compressor or vacuum pump running at peak performance and have been proven to provide the best protection of your investment. 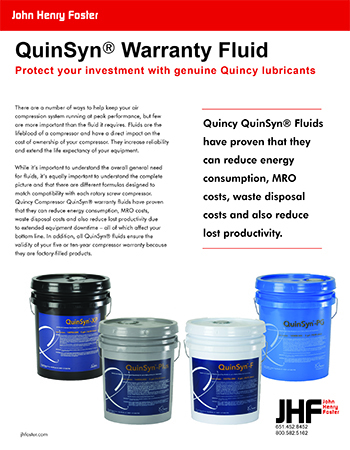 Maintain or extend the life of your warranty by using only genuine lubricants. 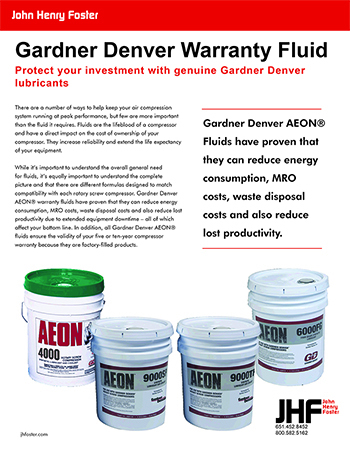 At JHF, we provide genuine lubricants for Quincy Compressors, Gardner Denver, I/R (Cameron) Centrifugal and CompAir to name a few. Aftermarket lubricants are specially formulated and manufactured to improve compressor efficiency and reliability, and are compatible with all types and brands of compressors. Aftermarket lubricants and air compressor parts are lab and field tested in thousands of compressed air systems with millions of hours of successful operation. Without the correct fluids and regular maintenance, your compressor can lose life expectancy. 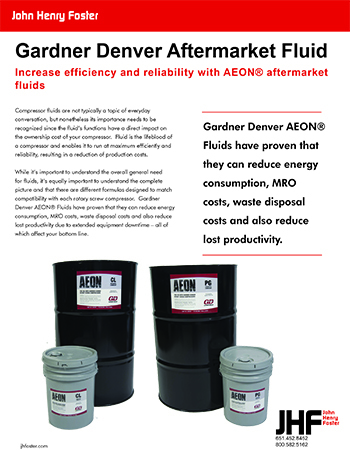 We provide aftermarket lubricants such as AEON CL and PG, that are tested and proven to provide optimum operating and service life results. IDENTIFY PROBLEMS IN YOUR LUBRICANTS BEFORE THEY COST YOU MONEY. Changes in the operation of a compressor are reflected in the properties and makeup of its lubricating oil. Scheduled analysis of lubricants identifies problems before they cost you money. The chance of compressor burnout, system failures, and unscheduled maintenance can be greatly reduced by oil sampling and scheduled maintenance. All too often, required oil sampling is forgotten by the owner and then warranties are denied when components fail. When you’re ready, contact us at 651.452.8452 or email to get all of the information you need about oil sampling and lubricants.